Unplug the range, remove the element and detach one of the power wires from the element (doesn’t matter which one). Secure that wire so that it doesn’t touch anything– alligator clips can be helpful here. Next, measure the resistance of the element. Should be something around 30 ohms. If you read something in the K-ohms or mega-ohms range, you be needin’ a new element– come git you one! Re-apply power and set the oven to bake (if I’m troubleshooting the bake element; broil if I’m troubleshooting the broil element). Using my multimeter, I measure the voltage at each of the power wires with respect to ground. In a normally functioning range, I’d expect to read 120vac at each wire. The wire that’s missing the voltage represents the circuit I need to troubleshoot. 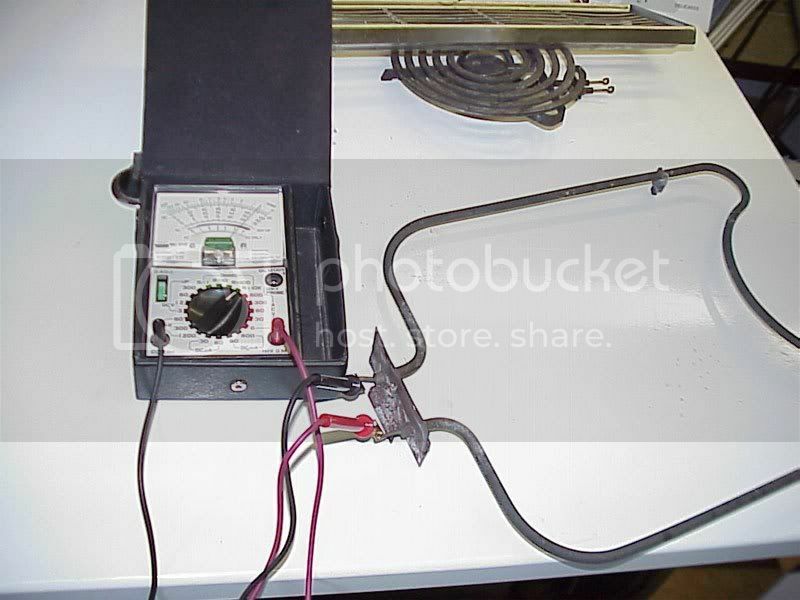 A variation on this procedure for cases where the element heats up with the range turned off is to do the same voltage measurement but with the controls set to off. In this case, the wire that’s still supplying voltage to the element represents the leg of the circuit that I need to troubleshoot. This entry was posted in Oven Repair, Range Repair on May 12, 2009 by Samurai Appliance Repair Man.